With a strong emphasis on technical innovation and design, 360 Vision Technology, the leading UK CCTV manufacturing company, has partnered with Navtech Radar, to create effective surveillance camera solutions for wide area security monitoring and intruder detection. 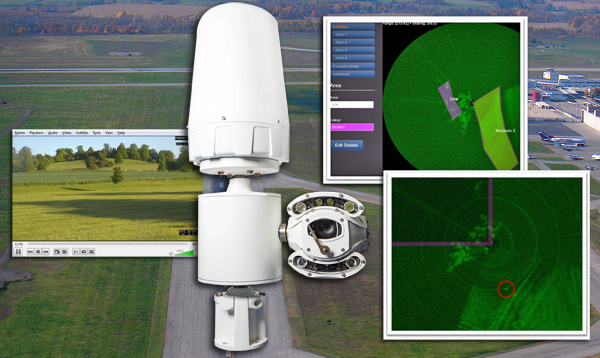 Perfect for many electronic surveillance applications, radar technology is often thought to be the preserve of only airports and ports, but the advantages of radar can be used across a wide variety of security surveillance applications. Radar operates using the same principles as echolocation – the same system that bats and dolphins use to navigate with, by emitting sounds that bounce off nearby objects. Based on the volume of the sounds that return and the time it takes, they are able to produce an accurate map of their environment. Instead of sound, radar transmits a pulse of radio energy, so in a similar way that echolocations works, radar is able to accurately determine the position and range of an object by measuring the time it takes for the radio energy to be reflected and returned. Because the speed that the radio energy travels at is known, the radar receiver can measure the time it takes for the energy to return, and using its built-in software, instantly and accurately calculate the precise distance and position of the target. Additionally, based on how much radar energy is reflected back, a figure of merit can be calculated for each target, and the size and identity of objects determined by the built-in software. A radar receiver is an extremely sensitive piece of measuring equipment that detects target objects along with an element of environmental ‘noise’ from any area of coverage. To reduce the chance of false alarms, sophisticated radar technology software can apply a threshold that a signal must exceed before it is considered to be a valid target. This level of target identification can be critical to systems covering areas where traditional detection methods, such as fence line detectors or camera analytics software may fail to identify an object clearly enough. This will lead to false alarms and operators being alerted needlessly, causing frustration in the control room, and an ineffective increase in overall workload for each member of the security team. Radar can track multiple objects too, up to forty in the case of 360 Vision Technology’s unique Predator Radar ‘all-in-one’ wide area PTZ camera. Its sophisticated on-board software will identity targets objects and continue to track them until they leave the monitored area (or beyond if required). This helps CCTV operators to be alerted to a situation, and identify where and what the object is – greatly reducing false alarm rates compared to passive detectors that only know that something is in the area – not it’s path or identity. Versus analytics, radar has the advantage of gathering information from a three-dimensional map of any scene, and giving an accurate bearing to within 17cm, even at an extended range. Whereas analytics based systems need to make important alarm decisions on information deduced from a two dimensional screen and individual pixels, so therefore cannot be as accurate at identifying objects and tracking their movements throughout a monitored area. This means analytics based tracking systems may alert an operator to movement or intrusion that is subsequently determined to be a false alarm by the operator – which again, results in increasing overall workload in the control room. Often video camera prices are directly compared to the cost of radar alternatives, but it is important to consider the total cost of installing and then maintaining a system. Radar units cover a minimum distance of 300m, and can be spread out accordingly. Video analytics based cameras typically require a spacing of between 60 – 80m, depending on the type of technology and implementation approach – this means that 5 times more video cameras are required compared to radar systems to provide the same area coverage. This has a direct impact on infrastructure and installation cost – meaning a radar system requires over five times less cabling, less power, less communication equipment and less manpower to install. Therefore, the total cost of installation is far lower for a radar system compared to a typical camera system. Additionally, radar units do not require regular maintenance. A service is required only once every five years, to change wearing parts – a process that often takes less than 45 minutes per radar head. This means less downtime for system maintenance and reduced cost versus other alternatives. Video-based systems require careful control of the ambient environmental conditions to control the false alarm rate. These conditions are severely disrupted in the case of an on-site non-security procedure or incident and can perform poorly in adverse and changing weather conditions – greatly increasing the false alarm rate. The ability of the radar system to perform in smoke, fire, fog, and even extreme weather such as sandstorms means that detect and follow functionality and reliability remains unaffected – no matter what the environmental conditions. A significantly reduced false alarm rate ensures increased operator confidence and reduces the fatigue generated by the need to investigate high levels of false alarms. Confidence in a radar-based system ensures operators remain fresh and alert, with the ability to respond quickly to genuine alarms. 360 Vision’s Predator Radar is an integral radar controlled, 360 degree, auto tracking and following ‘all-in-one’ PTZ camera, with the power to automatically detect and continually monitor targets – to provide a powerful and comprehensive security surveillance solution. Designed for high-security applications where the fast detection of objects or individuals is vital, such as within perimeter protection fence lines, sterile zones, prisons, borders, airports and military sites, Predator Radar can track up to 40 targets simultaneously with 400m of coverage. Predator Radar is optimised for simple and fast installation, with minimal setup required. And thanks to its choice of 0.013 or 0.008Lux integrated HD video surveillance camera and radar unit construction, no servers or software is required for commissioning. Utilising its integrated Navtech radar technology, Predator Radar scans 360 degrees twice every second to detect and track objects, with all alarm activations overlaid on screen. The camera unit’s advanced radar detection is unaffected by weather conditions, so object detection and alarm functionality is continuous, even in adverse weather conditions. 360 Vision Technology radar camera solutions support effective security, safety and site management all over the world, from the protection of national borders to protecting utility and commercial sites.